High intensity heaters are easy to install. Simply suspend with chain from the ceiling, being sure to meet all clearance to combustible requirements and mounting height recommendations, and connect to thermostat. No flue is required. Ventilation of the building may be necessary when used as a total heating system in order to dissipate products of combustion (mainly water vapor). Unlike other brands, Enerco heaters can be postioned horizontal (pointing straight down) up to a 45 degree angle, making them among the most versatile high intensity heaters on the market. NDSP-5 - Natural Gas Automatic Spark Pilot with Safety Burner Shutoff, 24V, AC Control with Intermittant Pilot (Pilot is off when heater is off). Transformer (120/25V) is shipped loose with each heater. LA-5 - Propane Gas Automotic Spark Pilot with Safety Burner Shutoff on Pilot and Burner, 24V. AC Control with intermittent pilot (Pilot is off when heater is off). Transformer (120/25V) is shipped loose with each heater. PP - Natural or Propane Gas - Power Pile (self-energizing) control. No outside electrical source required to turn heater on and off. Manually lit pilot. Safety Shutoff on Pilot and Burner. Power Pile Thermostat shipped loose with each heater. Model 4040 - can be field converted down to 30,000 BTU's. Auto service garages, aircraft hangars, factories, entryways, pump houses, refineries, shops, over assembly lines, loading dock areas, freeze control and many more. Superior Radiant high intensity heaters are easy to install. Simply suspend with chain from the ceiling and be sure to meet all clearance to combustible requirements and installation guidelines and connect to thermostat, timer or on/off control. 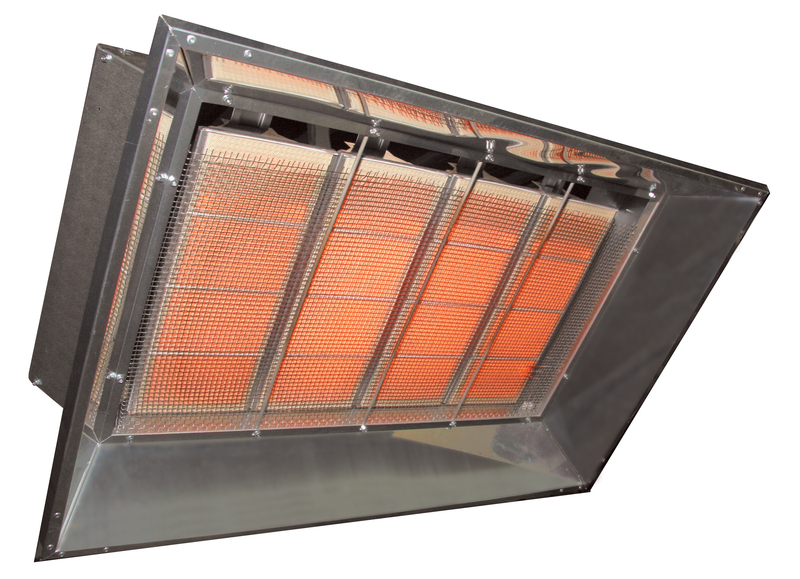 Since these heaters are vent free, ventilation of the building space may be necessary to eliminate excess humidity. Model No. BTU/HR. Clearance to Combustibles Reflector Dim. BTU/H 10 Deg. 35 Deg. Direct Spark Igntion - Requires electrical power. Millivolt Ignition - Has constant pilot. No electricity.